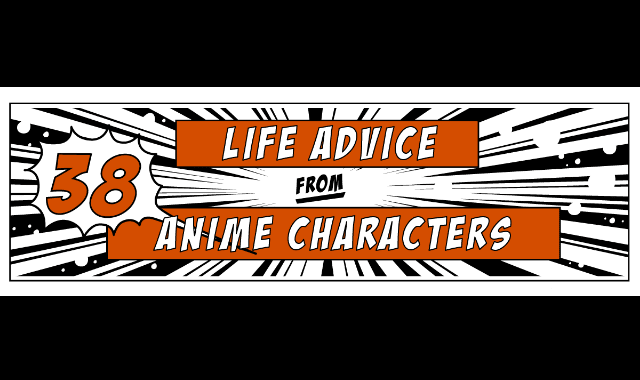 38 Life Advice from Anime Characters #Infographic ~ Visualistan '+g+"
In Japan, anime is the term for animation, which encompasses all animated media including those produced by other countries. Outside of Japan, anime generally refers to a specific Japanese animated style characterized by whimsical and fantastical themes, vibrant graphics, larger-than-life characters, and energetic soundtracks. Of course, the plethora of themes, settings, characters, and styles depicted in Japanese anime is incredible; there is truly something for everyone to enjoy! Japanese animated television shows and films are cherished by many, offering entertainment, wisdom, and delight to both children and adults alike. If you are seeking to be terrified, there is much to choose from. If you are seeking to be inspired, there is no shortage of profound, uplifting anime shows and movies. If you just want something cute and light-hearted, there is plenty of that too! This infographic is a collection of quotes (created and designed by AAAStateofPlay.com) from iconic anime characters to inspire, enlighten, and provoke thought.